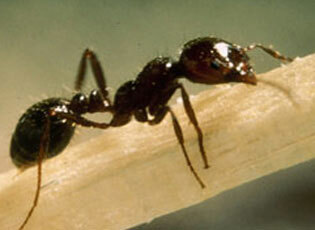 Fire ants cause millions of dollars in agricultural damage each year. Not only do they build large mounds that damage nearby plant roots and farm equipment, they also cause painful stings to animals and people. Sam Houston State University has received a $115,579 donation from the Walker County Fire Ant Control Committee through the Sam Houston University Foundation to examine ways to combat the effects of two invasive species in the county. The funds will be used for “scientific efforts to determine methods and procedures of controlling and/or eradicating the crazy ant and the fire ant,” according to Joe Sandel, president of the Walker County Fire Ant Control Committee Board of Directors. The work will be under the direction of Jerry Cook, associate vice president for research and sponsored programs, at the Institute for Invasive Species located at SHSU. Preliminary plans call for bringing an additional researcher to study methods of controlling the two species of ants, working with chemical companies and pest control operators to introduce environmentally safe baits, and testing products locally in the field. The Environment Protection Agency banned the use of Mirex in 1976, so the committee invested the money that had not been used, which was around $27,000. Through the years, the $27,000 grew to more than $115,500. “We learned about the establishment of the Institute for the Study of Invasive Species at Sam Houston State University, and we felt that a donation to be used to develop ways to handle the fire ant and crazy ant problem in Walker County would make good use of the money,” Sandel said. The donation was made through the university’s foundation, a private support organization, which re-organized and changed its tax affiliation earlier this year from a Section 509(a)(3) tax-exempt status to a 501(c)(3) tax-exempt corporation, in part to be able to accept gifts on behalf of the university such as the one from the local fire ant committee. The committee’s donation is an example of what university officials hope to see continue in the future, as other groups learn of the foundation and its new status. “Some companies, foundations and individuals restrict their contributions to 501(c)(3) tax-exempt organizations, and most other major universities have partnerships with foundations such as the Sam Houston University Foundation to assist in private fund raising,” said Frank Holmes, SHSU vice president for University Advancement. “The foundation’s move earlier this year to change its tax status and become more actively involved in the philanthropic support of the university now permits the university to receive funds from private organizations such as the Walker County Fire Ant Control Committee to advance research efforts,” he said.